Sign Up | InMotion Personal Training is Worcester's and MetroWest's leading in-studio an in-home personal training concierge service. Congratulations! You’re one step closer to a healthier body & mind :) We’ll contact you within 24 hours. TEXT OR CALL (774) 279-8373 TO SCHEDULE YOUR CONSULTATION NOW! Tired of feeling powerless when it comes to your body? Want to get rid of that nagging pain that drains your every waking moment? What if you could feel 25 again with more energy than ever to spend with your loved ones? You actually could (within 30 days)... EVEN if you think it's too late and EVEN if you don't have enough time or knowledge. We make exercise Convenient, Efficient, Effective, and Fun, making sure YOU reach your goals sooner! NO cookie cutter workouts. NO unhealthy supplementation. JUST hard work & dedication. Click below because you wouldn't be reading this if you didn't want to make a change, right? 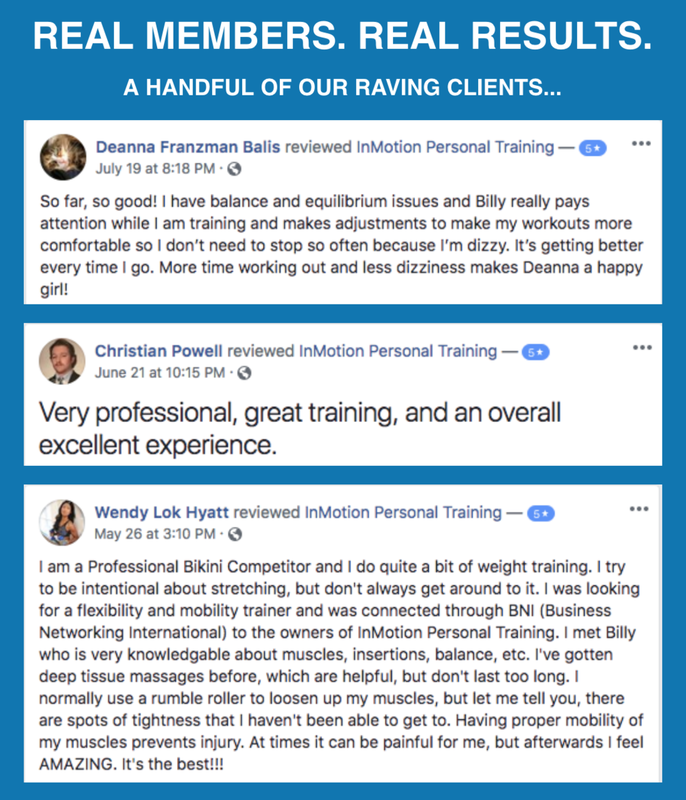 Our client testimonials prove it! What Does Your FREE Consultation Entail? Your complementary consultation is an obligation-free 3-session consultation process where we'll determine your goals, assess your fitness level, and prioritize your needs. This comprehensive assessment protocol allows us to develop a completely individualized fitness plan to ensure the results we continue to help clients achieve. 1) Tour & Initial Consultation - One of the owners will begin by walking you through a tour of our facility. We'll discuss your prior injuries, medical conditions, exercise history, physical ailments, current diet, and current lifestyle habits. You'll then get a chance to explain your goals. We call those 'your wants'. Lastly, we'll explain why our scientifically-proven approach to exercise programming is guaranteed to progress you towards becoming the strongest version of yourself, physically and mentally! 2) Fitness Evaluation - This evaluation consists of three major parts: InBody 370 (body composition) report, Functional Movement Screening (mobility & stability) assessment, and InMotion's unique set of strength/cardiovascular tests. The data we receive from this evaluation allows us to determine your weaknesses, imbalances, compensations, and overall injury risk. We call these 'your needs'. With one of the most comprehensive fitness evaluations in the industry, analyzed by some of the top fitness experts, you can expect program individualization like you've never experienced before. 3) Demo & Exercise Implementation Plan (EIP) - This meeting begins with a 45-minute demo session where one of our fitness professionals will walk you through a workout and explain how each exercise will benefit YOU, particularly. Then we'll discuss your recommended Exercise Implementation Plan (EIP). This includes prioritized goal-setting (wants vs needs), session length (45 or 60 minutes), session frequency (1-4 workout per week), and suggested lifestyle habit improvements, along with any necessary exercise 'homework' for you to do yourself. IF WE AGREE ON YOUR EXERCISE IMPLEMENTATION PLAN (EIP) , THEN WE'LL GET YOU STARTED!